MECCA (Reuters) – Seven women sit in front of computer screens fielding distress calls from across Mecca ahead of the annual haj pilgrimage this week, in a first for Saudi Arabia as it tries to expand participation in the workforce. The seven, almost all wearing the black niqab over their faces, form the first women’s section of an emergency call center in the kingdom, which has begun offering more education and employment opportunities to the half of the population that has traditionally stayed at home. The women verify a caller’s location and request, which could be related to fire, crime, illness or a traffic accident, before passing the information on to first responders. In the conservative kingdom, that’s a big shift. However, the Saudi government has begun introducing gradual reforms to open new job opportunities for women as part of a vision to wean the country off oil – on which it relies for more than 60 percent of its income – and transform society. “Saudi women are present in multiple fields, so they can also be present in the security sector,” 31-year-old Baara al-Shuwaibi, who studied English at a Mecca university, told Reuters, headphones hanging over her ears. The women all speak English and received training before starting their jobs in recent weeks. Dozens of men sit in a separate room doing the same work. “I receive a call, check the location and send the request to the proper authority as fast as possible, especially if it’s an emergency like fire or ambulance,” Shuwaibi said. The National Operations Centre in Mecca launched two years ago, becoming the first in the kingdom to unify government response services. There are plans for similar sites in Riyadh, Medina and the Eastern Province. This is the first year the women’s section will operate during the haj, which is expected to attract about two million Muslims from around the world for a week of sacred rituals starting on Wednesday. The world’s largest annual gathering of Muslims has in the past seen numerous deadly stampedes, fires and riots, and the authorities have been preparing for months to handle any violence, disease or a crush like the one that killed hundreds in 2015. 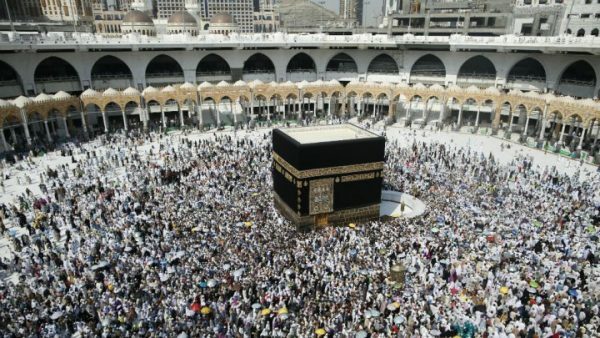 Major General Abdel Rahman al-Saleh, who runs the operations center, said it receives around 65,000 calls each day during haj, 50 percent more than normal. “We consider the women’s section a step forward to demonstrate that women can work in any place and in any field,” Saleh said. There are plans to increase the number of women and offer them advanced training, he said. Hassa al-Badi, who manages the women’s section and has a master’s degree from an American university, said women callers sometimes asked to speak to another woman due to the sensitivity of their request. “Women are now present in the security sector and, God willing, they will continue to advance,” she said.